In the article published in this issue (pp. 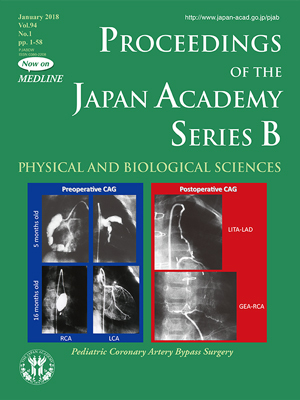 1-19), “A new arena in cardiac surgery: pediatric coronary artery bypass surgery (PCABS)”, the author, Dr. Soichiro Kitamura describes the development of PCABS utilizing the uni-or bilateral internal thoracic arteries (ITAs), which has become the standard operation for coronary artery obstruction due to Kawasaki disease (KD) and congenital coronary diseases in infants and children. In this cover figure, angiograms are shown before and after surgery in a one-year-old boy who developed giant coronary aneurysms in all coronary artery systems, a typical severe KD case, at the age 5 months. At the age of 16 months, the right coronary artery was totally obstructed at the outlet of the aneurysm and 95% stenosis at the origin of the left anterior descending artery. Aneurysms of the left main coronary trunk and the circumflex artery underwent spontaneous regression, which is also a common phenomenon in KD. Two arterial grafting procedures were performed using a surgical microscope and resulted in good graft patency, and the patient is now conducting normal growth and life. Sudden death or myocardial infarction in children occurs frequently following KD, and KD was recognized as a formidable disease in the 1970s when coronary artery sequelae occurred. Attempts to rescue these children by surgery conducted by Dr. Kitamura’s group have cast light on the surgical treatment of coronary complications. PCABS utilizing the ITAs was innovative because of the capability of longitudinal and circumferential growth by the ITA graft in response to the child’s subsequent somatic growth.